Coronary artery stenosis is a rare phenomenon in children compared to the widespread incidence in adults. Reported underlying diseases in the pediatric population are postoperative coronary artery stenosis after surgery for anomalous left coronary artery from pulmonary artery (ALCAPA), primary ostial stenosis (isolated or in combination with vascular disease like Williams-Beurensyndrome, Takayasu arteriitis, or Kawasaki disease), along with metabolic disorders as familial hyperlipidemia. , Coronary stent implantation in children is generally not considered a standard treatment option due to technical difficulties and potential complications. Nevertheless, several case reports and caseseries describe successful implantation with acceptable short-term experiences in children, mainly in the age between 3 and 8 years. The following case presents the potential of coronary artery stent implantation as a long-term remedy in young children by describing the treatment of a currently 8-year-old patient who received stent implantation for left main coronary artery (LMCA) stenosis at the age of 6 months. A 6-month-old infant was referred to our center with severe congestive heart failure. Diagnostic work-up including cardiac catheterization showed anomalous origin of the left coronary artery (ALCAPA, syn. Bland-White-Garland syndrome) with extreme dilation of the left ventricle (left ventricular end-diastolic volume index (LVEDVi) 240 ml/m 2 ), severely reduced left ventricular ejection function (LVEF 10%) and pulmonary hypertension. Surgery was performed with reimplantation of the anomalous LMCA to the aortic root and patch reconstruction of the former pulmonary origin. The postoperative course was complicated by continuing impairment of left ventricular function. Following acute clinical deterioration with signs of congestive heart failure the infant underwent cardiac catheterization on the 29 th postoperative day. The procedure was performed under sedation. Selective angiography revealed severe stenosis of the proximal LMCA [Figure 1]a and b. Only small collaterals led from the right coronary artery to the left circumflex artery. A 0.014'' coronary guide wire A 0.014" coronary guide wire (Galeo ES, biotronik) was advanced into the left coronary artery via a 4F left coronary 1.5 modified supertorque catheter (Cordis, Miami, Florida). This was stabilized with a long 4F sheath (Check-Flo Performer® Introducer, Mullins Design, Cook Medical Inc, Bloomington, USA) placed in the distal ascending aorta. 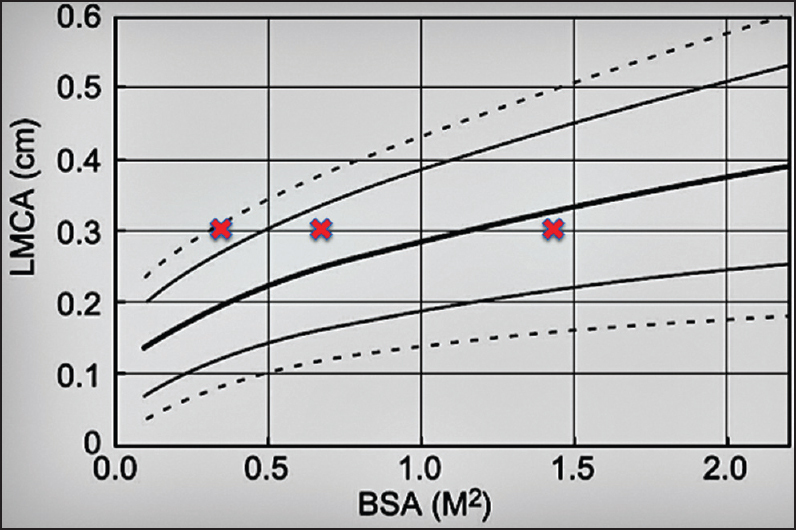 Balloon dilation (Maverick 2™ Bloomington, ×12 mm, Boston Scientific, Natick, Massachusetts, USA) of the stenosis did not lead to a significant improvement. After an interdisciplinary discussion of the therapeutic options and in view of the patient's poor general condition the decision for stent implantation was made. Using the same guide wire and long sheath, a drug-eluting stent (Promus Element, 8mm, Boston Scientific, Natick Massachusetts, USA) was implanted in the LMCA. No complications occurred. Appropriate stent position and complete relief of the stenosis were confirmed by angiography [Figure 1]c and d. Fluoroscopy time and area dose product were 12.8 min. and 557se pr 2 . After the procedure, clopidogrel was added to acetylsalicylic acid for platelet inhibition. Technically successful LMCA stenting having been concluded, cardiac function improved slowly. Follow-up angiography 10 days after intervention showed unimpeded flow through the stent. Antiplatelet therapy was initiated immediately after the procedure, using a combination of acrylic salicylic acid and clopidogrel. The patient was discharged on day 32 after intervention. During follow-up, slow but steady improvement of functional status and cardiac function were observed. Cardiac catheterization 3 years 8 months after stent implantation showed no in-stent or coronary restenosis with a proximal LMCA diameter at the 50 th percentile for age [Figure 2]. Left ventricular size and function had normalized completely (LVEDVi 72ml/m 2 and LVEF 76%). Clopidogrel was discontinued and the patient was left with acetylsalicylic acid as single platelet inhibition after its effectiveness had been documented by platelet function testing. The patient is seen regularly by his pediatric cardiologist. During the last follow-up at 7 years of age, he was clinically well and had a normal exercise tolerance. Coronary stent implantation in small children is a technically feasible yet complex procedure. The main risk in pediatric patients is restenosis and acute thrombotic stent occlusion. Another consideration of interventional treatment in this age group is, that the child might "outgrow" the stent  Reviewing literature, several reports document coronary stent implantation in pediatric patients. Yet, less than 10 cases of children below 15 months of age are reported. These particularly young patients seem to show a higher incidence of stent related complications in contrast to patients beyond the age of 3 years. , As stated by Bratincsák et al., a stent diameter of more than 2.5 mm seems to be associated with a significantly longer short-to mid-term survival free from reintervention. Uniformly, nearly all reported patients were treated, at least initially, with a combination of aspirin and clopidogrel. Despite the lack of data supporting this approach, we had chosen a drug-eluting stent hoping to reduce the risk of in-stent stenosis. Consequently, dual platelet inhibition was initiated and continued for 3.5 years. The presented case shows the potential of stent implantation to serve as a long-term solution in selected patients even if they are very young. This assumption is based on the fact that this particular patient revealed a stent diameter corresponding to the 50 th percentile of coronary diameter at the age of 4 years [Figure 2]. Consequently, presupposing steady growth, the patient will possibly reach adulthood without another coronary artery intervention and a still adequate coronary diameter at the 40 th percentile of the affected LMCA at the age of 16 years. In selected cases, coronary stent implantation may be an effective long-term treatment of coronary artery stenosis, even in very young children. Special thanks to Mrs Bettina Müller for linguistic support and Mrs Jacqueline Richter for overall support. Bratincsák A, Salkini A, El-Said HG, Moore JW. 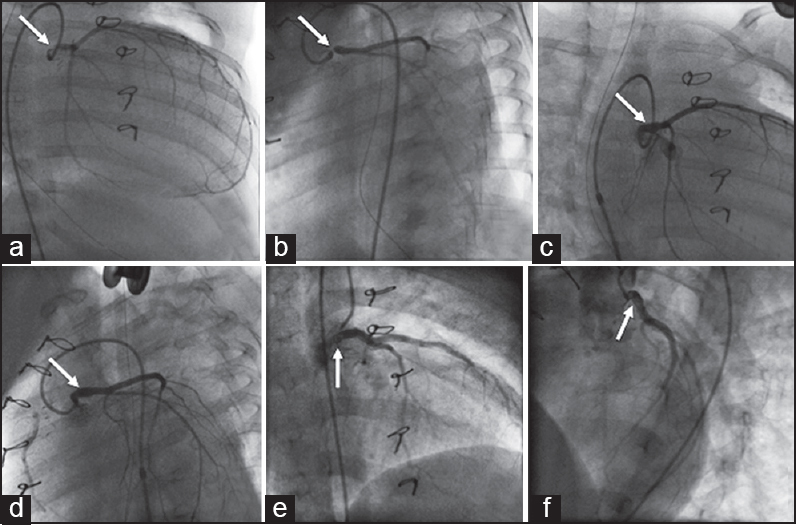 Percutaneous stent implantation into coronary arteries in infants. Catheter Cardiovasc. Intervent. 2011; 79:303. Viola N, Alghamdi AA, Al-Radi OO, Coles JG, Van Arsdell GS, Caldarone CA. Midterm outcomes of myocardial revascularization in children. J Thoracic Cardiovasc Surg 2010;139:333-8. Tissot C, Cruz ED, Aggoun Y. Rescue left main coronary artery stenting for acute myocardial ischemia after coronary angiography in a 7-year-old girl with homozygous familial hypercholesterolemia. Catheter Cardiovasc Interv 2007;69:243. El-Segaier M, Lundin A, Hochbergs P, Jögi P, Pesonen E. Late coronary complications after arterial switch operation and their treatment. Catheter Cardiovasc Interv 2010;76:1027-32. Newburger JW, Takahashi M, Gerber MA, Gewitz MH, Tani LY, Burns JC, et al. Council on Cardiovascular Disease in the Young, American Heart Association; American Academy of Pediatrics. Diagnosis, treatment and long-term management of Kawasaki disease: A statement for health professionals from the committee on rheumatic fever, endocarditis and Kawasaki disease, council on cardiovascular disease in the young, American Heart Association. Circulation 2004;110:2747-71.